The Z is a mouse created by Swiftpoint that aims to revolutionize how mice works by introducing new features that benefit all users. When it comes to the mouse input device, not much has changed in the past decade or so. Manufacturers moved away from using a ball to power movement to other techniques, specialized devices came with dozens or more buttons, and DPI started to become important as well. Apart from that, you still click on buttons to perform actions and that is about it for the majority of mice out there. Some manufacturers tried to add more features to their products. Logitech's MX Master mouse enables you to control up to three devices at the same time for instance. Microsoft released a its Arc Touch mouse back in 2011 which brought a new design to the table. For real innovation, you have to look elsewhere. KeyMouse, as crazy as it looks, did so by combining mouse and keyboard. The Z looks like a gamer mouse on first glance with all its buttons and thingies attached to it. Its developer calls the mouse the most advanced gaming mouse ever. While it is too early to verify the claim -- the mouse is not available yet -- it could very well be considering what it offers on top of the usual mouse functionality. First of all, it supports pivot, tilt and roll, something that you don't find in any other mouse currently. Apart from that, its buttons support tactile feedback so that you may map different actions to the button depending on how hard you click. Examples? If you like to play shooters, you may use a mouse button to use a scope. You may then use the scroll wheel or buttons to zoom in, and another button to hold breath. With The Z, all actions can be mapped to the same mouse button. Right-click a bit to use the scope, click a bit deeper to zoom in, and even deeper to hold the breath for the perfect shot. Another gaming example: perform a normal attack with a regular click, and a heavy or special attack with a deep click. 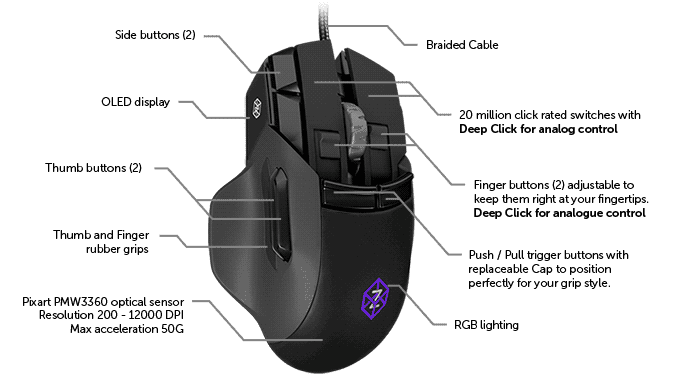 While gaming is one focus of the mouse, its deep click functionality offers new options for power users and regular users alike. 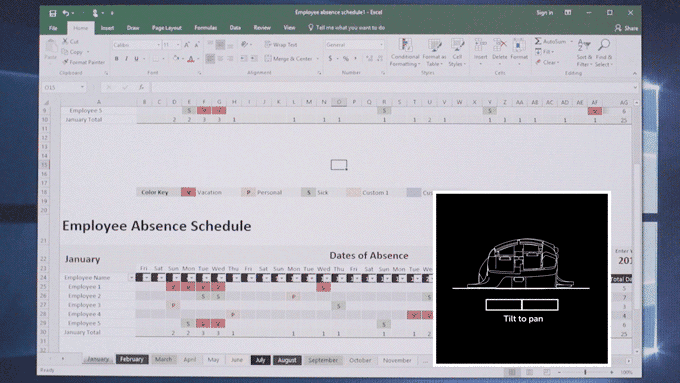 Since you can map different actions to same mouse button and use them using force, you may do the following in Word: double-click to select a word, press the mouse button a bit harder to select the paragraph, and a bit harder than that to select the entire document. Or map copy and paste to the same mouse button. Or set different brush thicknesses in Photoshop. Tilt and pivot are two new features that The Z supports. Tilt allows you to change the tilt angle of the mouse to perform actions on the screen. In a shooter, you may use it to lean left or right, and in a document, to pan. Pivot supports allows you to look left and right in shooters while moving forward, or use in-air gestures by lifting the mouse slightly in the air.